put your ideas to the test! 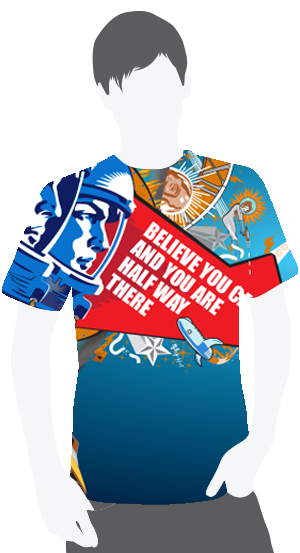 To reward and promote innovation in Drogheda secondary school students. An innovation is the development of a new or better way of doing something. It may be an improvement on an existing process, or a small modification or change that can make a big difference. 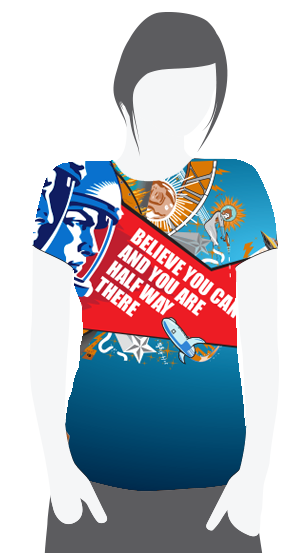 Most of all it is about original thought and using your skills and knowledge to progress or advance something. Innovators make things happen and change the world we live in. They are hard working, persistent and believe in their ability. Innovations can be small or big, but their effect is always to make change. The world needs innovators. Innovators save lives, invent new drugs, make things faster, smaller and more efficient. Innovators create jobs, wealth and improve the world we live in. The choice is yours - but - it’s got to be an original idea. Science and Technology category relates to innovation projects in any of the sciences. Enterprise/Business category relates to potentially profitable business innovation projects. Social Enterprise category relates to not-for-profit social innovations that improve or make better the communities we live in. Applications to the Young Scientist Exhibition or Louth Student Enterprise Awards are also accepted. There will be prizes in each category for both individual and team entries and one overall competition prize. You can download an application form here. The form also outlines the judging criteria and other key information about the competition. On Friday 11 May, the Drogheda Young Innovators (DYI) Competition Final for secondary school students took place at Coca-Cola International Services offices in Southgate Shopping Centre. Twenty shortlisted projects from the original forty-four applications, were reviewed in detail by the judges from Coca-Cola International Services, State Street, Fitz Scientific, The Mill Enterprise Hub, and Bricks4Kidz Louth. 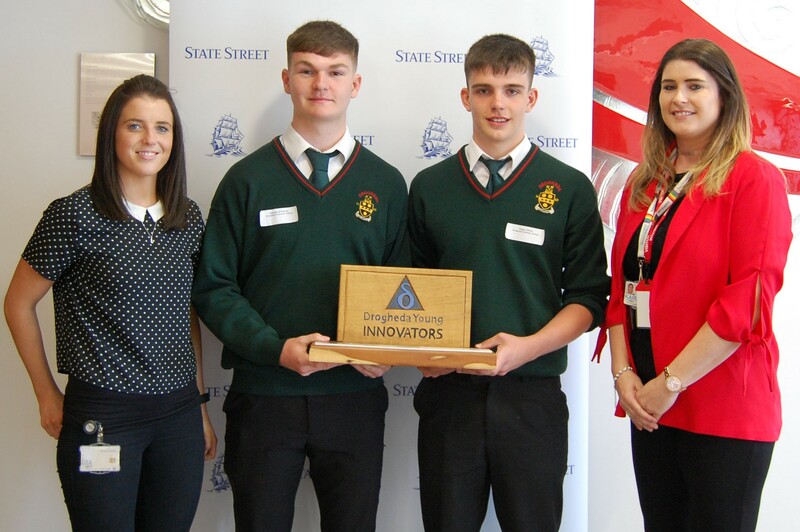 The overall winners were George O’Carroll and Hugo Collins, students at Drogheda Grammar School, who impressed judges with their social enterprise project, “Storyboard”. Storyboard was created by George and Hugo as learning tools used to help people with autism deal with anxiety in everyday life. They list out the exact steps that are taken when performing everyday tasks or going to new places e.g. going to the barbers. These are currently freely available in the Arc cinema, Southgate Barbers, Drogheda Leisure Park and in a few other places in Drogheda. Prizes were also awarded in each of the three categories (Science/Technology, Business, and Social Enterprise) for both individual and team entries. This is the fifth year of the awards which focus on all aspects of innovation and have become an integral part of the local school curriculum. According to Breanndán Casey, BDM of The Mill Enterprise, “This competition has gone from strength to strength each year, and with forty-four applications, it’s fair to say that innovation is alive and well in Drogheda. We work with our partners State Street, Coca-Cola International Services, East Coast Bakehouse, Bricks4Kidz and Fitz Scientific to visit all nine schools in the region to highlight the innovation that is currently occurring locally, and to ensure that students have an opportunity to flex their creative muscles”. Alison Cowzer of East Coast Bakehouse was one of the judges and commented “I am extremely impressed by the innovation on display today across all three categories, and some of the applicants would not be out of place on Dragons’ Den. Based on the level of innovation displayed, Drogheda’s future is very bright”. Alison also told the students to put aside the question of what they want to be in the future and focus on what they enjoy doing and what they are good at – by doing so, they will truly excel in their future careers and entrepreneurial endeavours. Organised by a voluntary group of local business people, teachers and The Mill Enterprise Hub, the competition challenges Drogheda’s students to think about an innovating career in science, social enterprise, or business. “We expect at least one in ten of Drogheda’s students will be running their own business when they finish education” says Geoff Fitzpatrick of Fitz Scientific. He continued “The applicants have already displayed great initiative and innovation, and the DYI project gives them a fantastic opportunity to work on ideas and interact with like-minded students and entrepreneurs”. 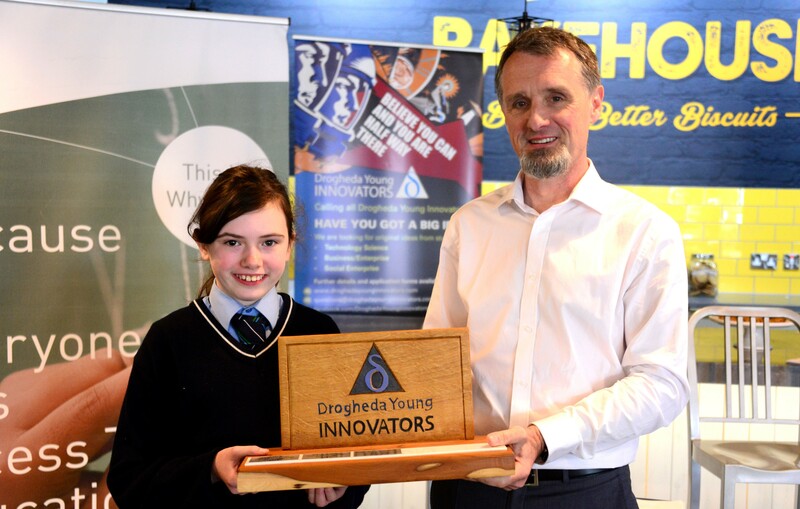 On Friday 12 May, the Drogheda Young Innovators (DYI) Competition Final for secondary school students took place at East Coast Bakehouse’s Centre of Innovation. Twenty shortlisted projects from the original 100 applications, were reviewed in detail by the judges. The overall winner was Blathnaid Murphy (pictured above with Geoff Fitzpatrick), a student at Our Lady’s College, Greenhills, who impressed judges with her business, “Daisy’s Pawsome Bowties”. 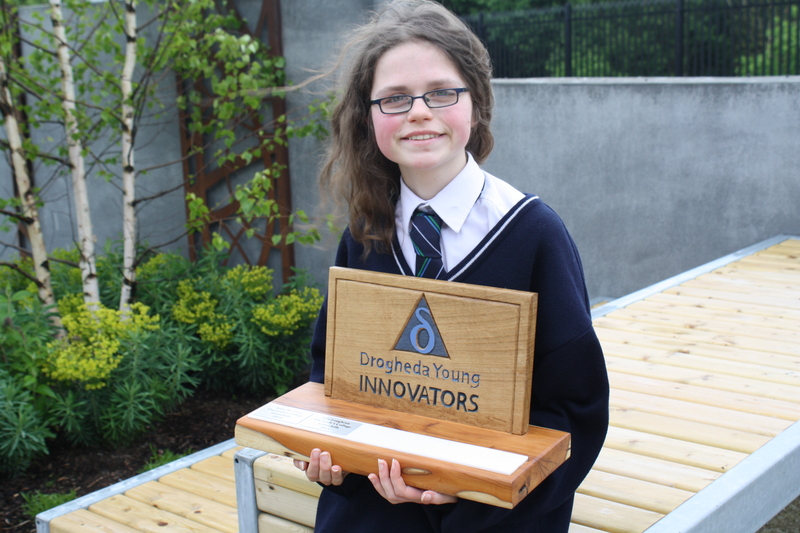 Blathnaid, at twelve years of age, is the youngest winner of the DYI competition. According to Breanndán Casey, BDM of The Mill Enterprise, “This competition has gone from strength to strength each year, and with circa 100 applications, it’s fair to say that Innovation is alive and well in Drogheda. We work with our partners State Street, Coca-Cola International Services, East Coast Bakehouse and Fitz Scientific to visit all nine schools in the region to highlight the innovation that is currently occurring locally, and to ensure that students have an opportunity to flex their creative muscles”. On Thursday, 12 May, the Drogheda Young Innovators Competition Final for transition year students took place at East Coast Bakehouse’s new Centre of Innovation. Twenty-one projects were shortlisted from the initial 52 applications, and prizes were awarded in each of the three categories (Science, Business and Social Enterprise) for both individual and team entries, and one overall competition prize. This is the third year of the awards which focus on all aspects of innovation. “The Drogheda Young Innovators competition has been a success over the past few years”, says Breanndán Casey, the BDM of The Mill Enterprise Centre, “This year the programme is being supported by some innovative local companies, such as State Street, Coca-Cola International Services, East Coast Bakehouse, Fitz Scientific, Paycheck Plus and MOR Solutions. It is great to see local companies showing their support to youth entrepreneurship projects in Drogheda and fantastic that we can highlight innovation that is taking place every day in our community”. The format of the competition changed this year, which resulted in a higher number of applications and greater support for local innovative companies. In March, more than 80 students attended an Innovation Workshop organised by the Coca-Cola International Services team in Drogheda. The students availed of an opportunity to work on their ideas for the Drogheda Young Innovators competition, and to practice some divergent and convergent thinking as part of the brainstorming process. Both Elle Loughran and Anna McEvoy of Our Lady’s College Greenhills have represented Drogheda and Ireland abroad in various youth entrepreneurship initiatives. In January 2016 Elle Loughran launched her own website www.tigertunity.com which aims to help second and third-level students to find work opportunities, scholarships and competitions . She also attended the Outbox Incubator programme in London last August for females making a valuable contribution to STEM (Science, Technology, Engineering & Maths). On Friday 15 May, eighteen students from St. Mary’s Secondary School, Our Lady’s College Greenhills and Coláiste na hInse Secondary School attended the prize-giving ceremony hosted at The Mill Enterprise Hub. 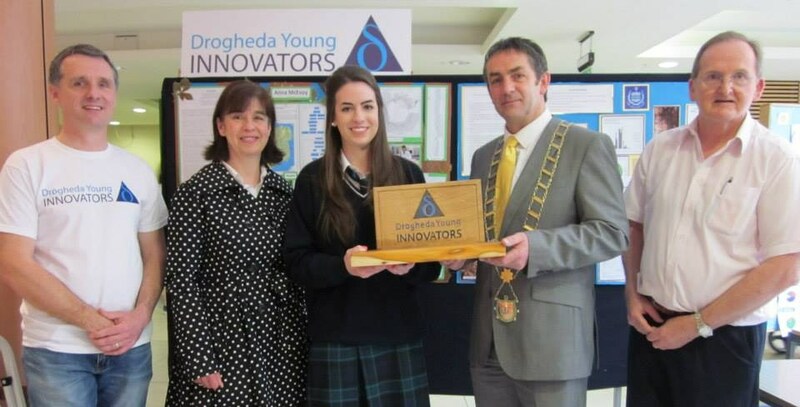 Drogheda Young Innovators is a competition to reward and promote innovation amongst secondary school students in Drogheda. This is the second year of the awards which focus on all aspects of Innovation. The awards were established by serial entrepreneur Geoff Fitzpatrick, in partnership with The Mill. Two individual and four group winners were chosen, with an overall winner, Elle Loughran (pictured above) from Our Lady’s College, receiving a cash prize of €300 for her Science project "Novel graphene functionalization to detect attraction". Last year’s winner, Anna McEvoy went on to win a trip to attend and exhibit at the Intel International Science and Engineering Fair (ISEF) in Pittsburg, Pennsylvania, where she has just won the 1st Place Monsanto Company Special Award. Anna McEvoy, pictured above, a 17-year-old student at Our Lady’s College in Greenhills, Drogheda, was awarded the title of ‘Sentinus Young Innovator 2014’ for her project ‘Aetiology of bleeding canker disease of Horse Chestnut trees’. Anna conducted research into the presence of bleeding canker on horse chestnut trees throughout Ireland and used an investigative method to identify the causal agent. For her award Anna will receive an all-expenses paid trip to attend and exhibit at the Intel International Science and Engineering Fair (ISEF) 2014 in Pittsburg, Pennsylvania. Her teacher, Ms Frances O’Regan, also received the Intel Educator of Excellence award and an all-expenses paid trip to attend at Intel ISEF 2014. In 2014 more than 120 schools from the primary, secondary and special education sectors competed in the Sentinus Young Innovators event which took place in the Odyssey Arena, Belfast and was attended by more than 3,000 young people. (c) 2018 All rights reserved. Drogheda Young Innovators.